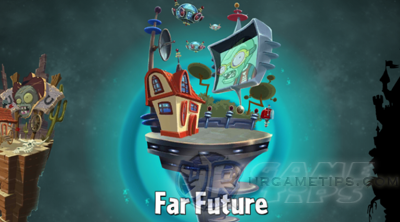 Here's a quick walkthrough and strategy guide for the "Far Future" stages in the action and arcade defense game - Plants vs. Zombies 2: It's About Time!. In the year 2323, the zombies will have brain extraction down to a science! Can the plants of the future save you from the undead of tomorrow? Far Future stages will introduce Power Tiles! These special tiles can share Plant Food effects to all other plants placed on similar Power Tiles. Note, to activate this chain, you must use your Plant Food on plants placed on Power Tiles. - Play Wild West Quick Walkthrough and Strategy Guide first before this guide! - Laser Bean: Hits all zombies ahead of it. - Blover: Blows away all flying and floating zombies, single use. - Citron: Shoots powerful balls of plasma. - E.M. Peach: Disables all machines in an area, single use. Destroys flying machines too! - Infi-Nut: Weaker than Wall-Nuts, but regenerates health over time. PF special = creates a line of defensive shield! - Magnifying Grass: Spend 50 Sun for a powerful attack. - Tile Turnip: Creates it's own version of Power Tiles! The first one is free but the next ones will require higher Sun requirements though. - Marigolds: Gives rewards in Zen Garden. - Sometimes it is a good idea to just ignore some Power Tiles, and focus more on your usual simple formations, just treat them as bonuses for your Plant Food. - Plant Food: I recommend that you use your Plant Food on plants placed on Power Tiles. - Always remember, if you see a "| Wall or Tall |" formation below, just place Tall-Nuts or slowly replace Wall-Nuts with Tall-Nuts. - Reminder: Plant Tall-Nut over a Tall-Nut to instantly regenerate them, same with Wall-Nuts. 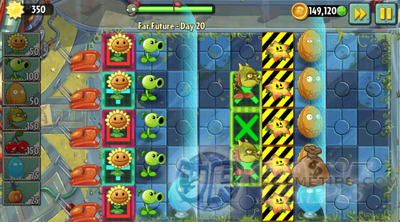 - Plant Food: Peashooter during Final Wave. - Plant Food: Peashooters or Snapdragons during Final Wave. - Let them reach the ground to collect the Sun for your plants. - Tap on the falling Sun Bombs to make them explode and damage nearby zombies. Be careful though because they can also damage your own plants, avoid it! - Plant Food: Snapdragons to defeat waves of tough zombies. - Blover: To blow away waves of flying zombies! - Plant Food: Snapdragons to defeat Robo-Cone Zombies. - Cherry Bomb: A nice addition to nuke tough zombies! - Plant Wall-Nut over a Wall-Nut to regenerate them. - Replace some Peashooters with Laser Beans later on. - Plant Food: Any Dragons, to defeat waves of Robo-Cone Zombies, reserve some for final wave. - Plant Food: Snapdragons to defeat those Gargantuars before they destroy your Walls! Make sure to put all 3 Red Power Tiles below your 3 center Snapdragons, refer below screenshot. For Green Power Tiles, you may put them anywhere you like. - Quickly set up 2 Dragons then protect them with Wall-Nuts. - Follow the formation above, just reserve 1 Plant for Blover or Cherry Bomb. Replace Wall-Nuts with Tall-Nuts if you have them in play. 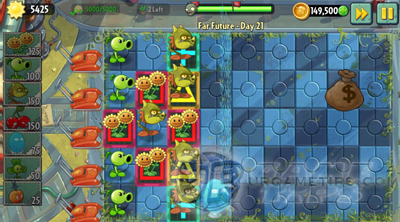 - Plant Food: Sunflower early game, then Snapdragons (especially at final wave). - Cherry Bomb: To help defeat zombies. - Plant Food: Snapdragon (center one) to defeat the first Robo-Cone Zombie and to get some extra Sun from Sunflowers! 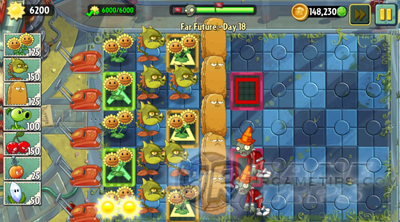 After that, just use your Plant Food on Snapdragons to defeat tough zombies. - Blover and E.M. Peach: To blow away waves of flying zombies! - Cherry Bomb and E.M. Peach: To help defeat waves of tough zombies. - Plant Food: Any, or just sit and watch till the end. - Plant Food: Snapdragon to defeat Gargantuars and some Disco-tron 3000 zombies. - Cherry Bomb: To help defeat Gargantuars and other tough zombies. - E.M. Peach: To halt Gargantuars when they are near your Tall-Nuts, combo with Snapdragons. - Plant Food: Snapdragons, to defeat all tough zombies. - Cherry Bomb: Use it only to defeat Mecha-Football Zombies. - E.M. Peach: To halt Mecha-Football Zombies, do not let them push your Wall-Nuts. - Refer to the screenshot above for formation. - Plant Food: Use your first Plant Food on your Infi-Nut to create a line of defensive shield! Renew the shield if needed. - Cherry Bomb: No need or optional. - Plant Food: Snapdragons or Any. - Start by planting Sunflowers, Peashooters, and 3 Tall-Nuts at the center. - Cherry Bomb and E.M. Peach: To help defeat Robo-Cone Zombies. - Plant Food: Use one PF on your Infi-Nut, then all to your Citrons, to defeat those Mecha-Football Zombies. Make sure to put all Power Tiles on the 1st column too. - E.M. Peach: To halt Mecha-Football Zombies. - Plant Food: Use one PF on your Infi-Nut, then all to your Magnifying Grass placed on Power Tiles. - Use E.M. Peach and Iceberg for support. - Start with the 3rd and 4th column formations first, use Cherry Bomb if necessary. 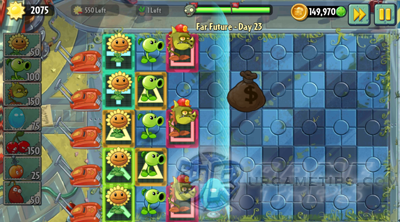 - Plant Food: Use it all on your Twin Sunflowers placed on the 3rd column Power Tiles to get lots of Sun. 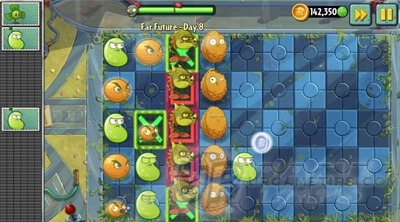 If you reached the target, reserve other PFs for your Snapdragons to defeat tough zombies at final wave. - Use Cherry Bomb and E.M. Peach as support. - Magnifying Grass: Optional, replace column 2 Snapdragons at later stage, if you like. - Plant Food: Any, or Snapdragons for Gargantuars. - Cherry Bomb and E.M. Peach: To help defeat Gargantuars and other tough zombies. 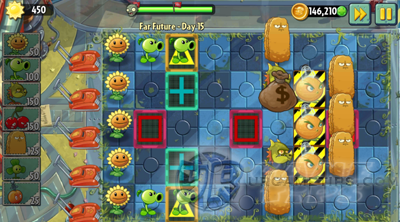 - Start by setting up your defenses first, one Infi-Nut at the 3rd and 7th column after some Sunflowers and Peashooters. Set up Peashooters to quickly eliminate Bug Bot Imps thrown at the center. - Plant Food: Quickly set up 2 Infi-Nut line shields, start with the one at the 3rd column. Recharge the shield if needed. - Slowly complete your Wall-Nuts to defend the Starfruits. - Cherry Bomb and E.M. Peach: To help defeat tough zombies. 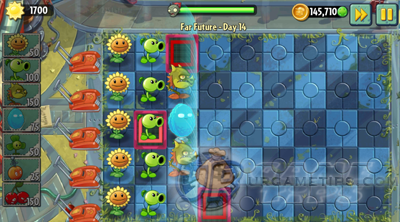 - Plant Food: One for the Infi-Nut, then all to the Twin Sunflowers (make sure you have 4 on those red Power Tiles). Once you reach the target, use them for the Snapdragons. - Just follow the formation above, then use remaining Suns for single use plants. - Plant Food: Use it on Infi-Nut to setup and recharge the Shield line, or on Snapdragons to defeat tough zombies at final wave. - Follow the formation above, you should have enough Sun and Plant count to use lots of single use Plants. 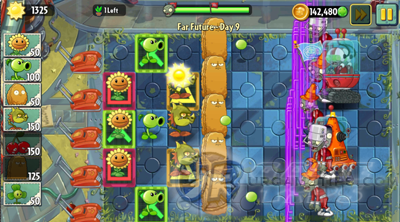 - Plant Food: Use it on Infi-Nut to setup a Shield line before the first wave of Bug Bot Imps. Recharge if needed. Use some on Snapdragons at the final wave. - Cherry Bomb, E.M. Peach, and Chili Bean: Use 1 at a time. - Plant Food: Any, or Snapdragons for tough zombies, especially Mecha-Football Zombies. - Cherry Bomb and E.M. Peach: To help defeat Mecha-Football Zombies. - Plant Food: Citron to defeat zombie mobs or tough zombies, especially Gargantuars and Mecha-Football Zombies (Save at least 2 or 3 PFs for them), best used with Power Tile if available. - Green and Red Power Tiles: Place them anywhere on the 1st and 2nd columns. - Blover: Use only against flying zombies. - Infi-Nut: Do not deploy those 3 Infi-Nuts, keep them to only get Citron and Laser Beans. - Tips: You have lots of plants here to deploy, so place them fast to do massive damages. - If Dr. Zomboss targets your plants with missiles, use your Plant Food to save them. 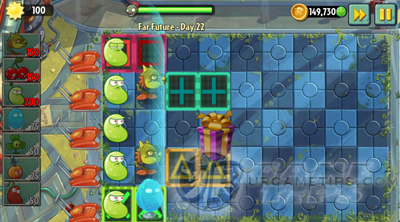 - When Dr. Zomboss' Hp drops below 25%, he will summon multiple Mecha-Football Zombies, just use your Plant Foods to clear them fast.